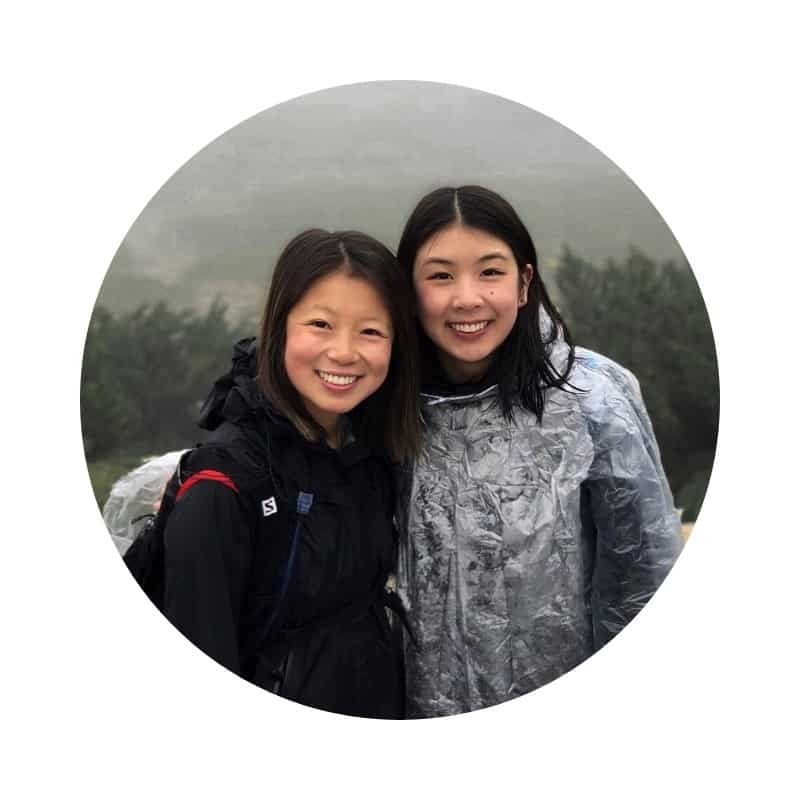 After traveling to over 30 countries in Europe, it’s rare that Hope and I still stumble upon a new European city that we believe to be completely underrated and can call one of our favorites. But that’s exactly what happened when we visited Plovdiv, Bulgaria a few weeks ago. Although Plovdiv is only Bulgaria’s second biggest city, we found it to have so much more charm, history, and character than the capital of Bulgaria, Sofia. With its Roman ruins, beautiful scenery, and hospitable people, Plovdiv is one of the best cities to visit in Bulgaria and contains many of the top 10 tourist attractions in Bulgaria as well. 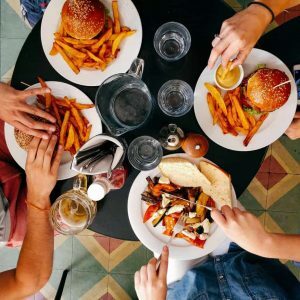 Located only one hour north of the Rhodope Mountains and less than two hours from the capital of Bulgaria, it is a clear winner for places to visit near Sofia with a bustling Old Town and some of the best Bulgarian food and drink. 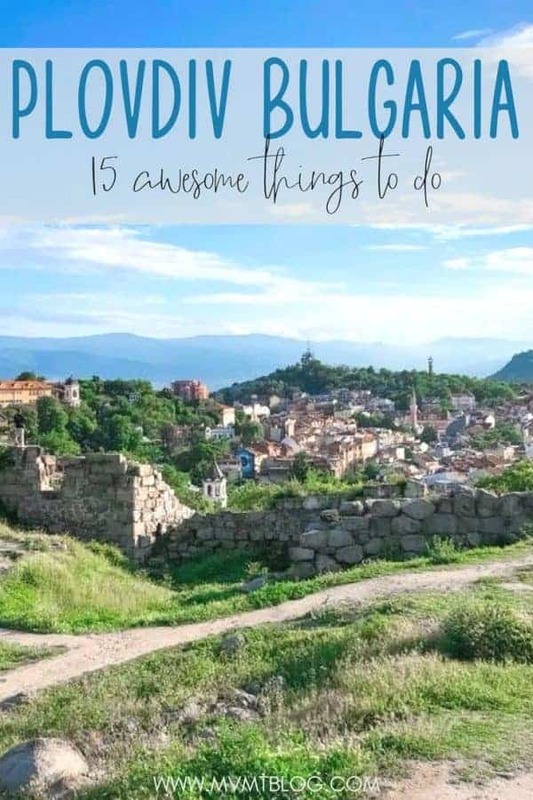 Don’t forget to add Plovdiv to your list of Bulgarian cities to visit, and don’t miss these 15 awesome things to do in Plovdiv on your next trip to Bulgaria. Did you know the longest pedestrian street in Europe is in Plovdiv? 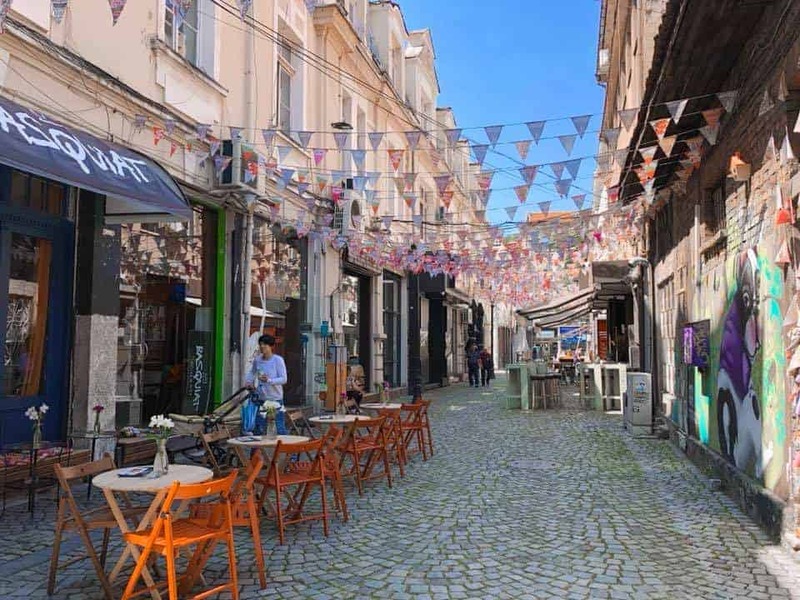 At two kilometers in length, Knyaz Aleksandar I (the official name of the street) is home to a multitude of shops, cafes, and restaurants. It starts as a wide street at the Central Square and splits off into Plovdiv Old Town and the Kapana District, also known as the “Trap.” Most of the houses on the main street were built in the early 20th century and combine design elements from the Classicism, Seccession and Postmodernism eras. Of note are the little statues at the tops of the buildings, which are interesting to observe as you walk along the pedestrian street. And finally, if you’re looking for traditional Bulgarian food along this street, I would highly recommend trying some Bulgarian yogurt at Parrilla & Asador. Don’t be fooled by the Argentine flavor of this restaurant – locals love this spot for traditional Bulgarian yogurt. 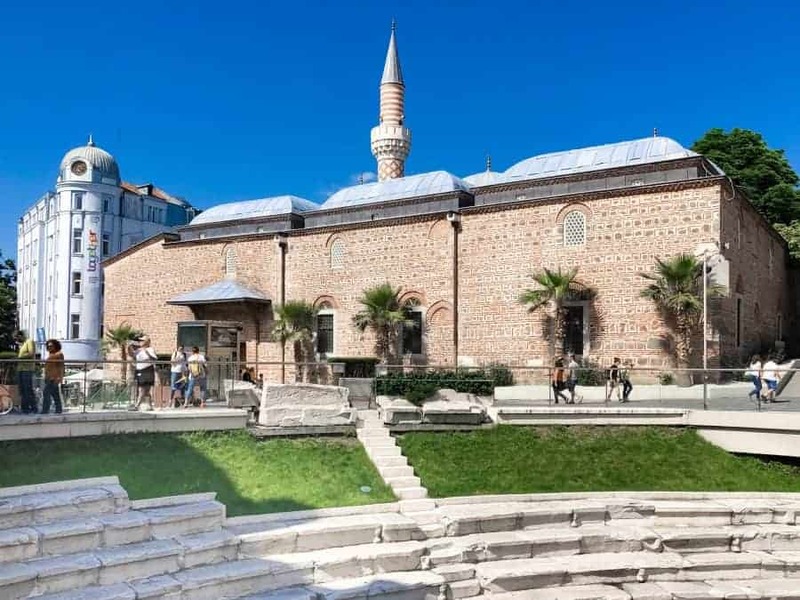 The Dzhumaya Mosque is the main Muslim mosque in Plovdiv today but was actually first built as a cathedral back in the mid-1300s when the Ottoman army conquered Plovdiv. Later, in the 15th century, Sultan Murad I took over Plovdiv and demolished the cathedral, rebuilding in its place the mosque we know today as Dzhumaya. The large mosque has nine domes, a prayer hall, and a minaret at the northeast corner, which is an excellent landmark to use while finding your way back to the main pedestrian street. Similar to most mosques, only Muslims are allowed to enter, so unfortunately I did not have an opportunity to see the inside of the mosque, but I heard it is just as beautiful on the inside as it is on the outside. We really didn’t know what to expect when visiting Plovdiv, but one thing we were not expecting to find were ancient Roman ruins. 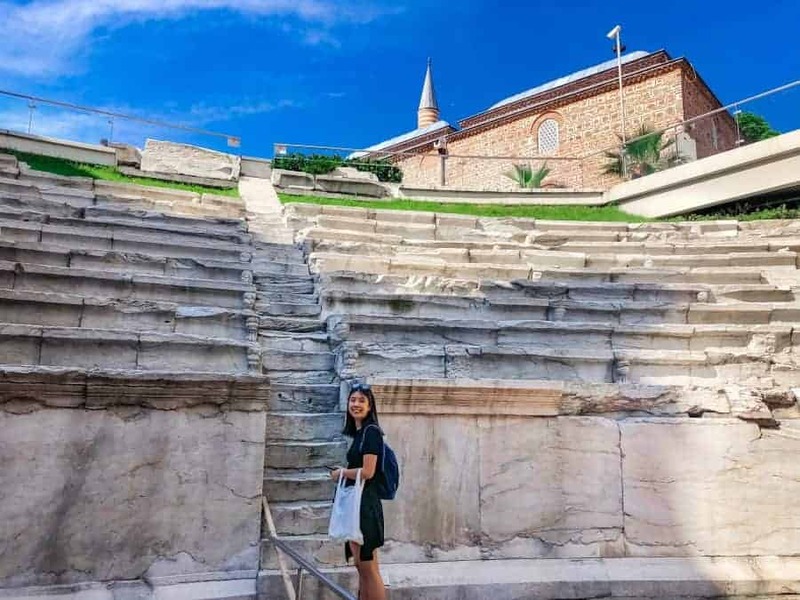 Not only are there ancient Roman ruins scattered all across Plovdiv, but it is home to one of the only ancient Roman theaters that is still in use today. 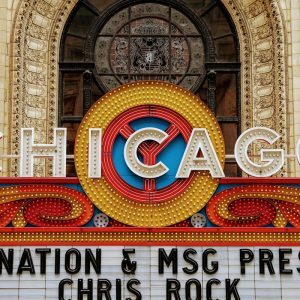 That’s right – you can go to the symphony or a Sting concert at an ancient Roman theatre. Not even Athens or Rome can lay claim to a still functioning ancient Roman theatre. You can search for a list of Plovdiv Roman theatre events here and try to schedule a trip around one of these events, if possible. After all, how many people can say they’ve been to a concert at a concert venue built in the first century A.D.? 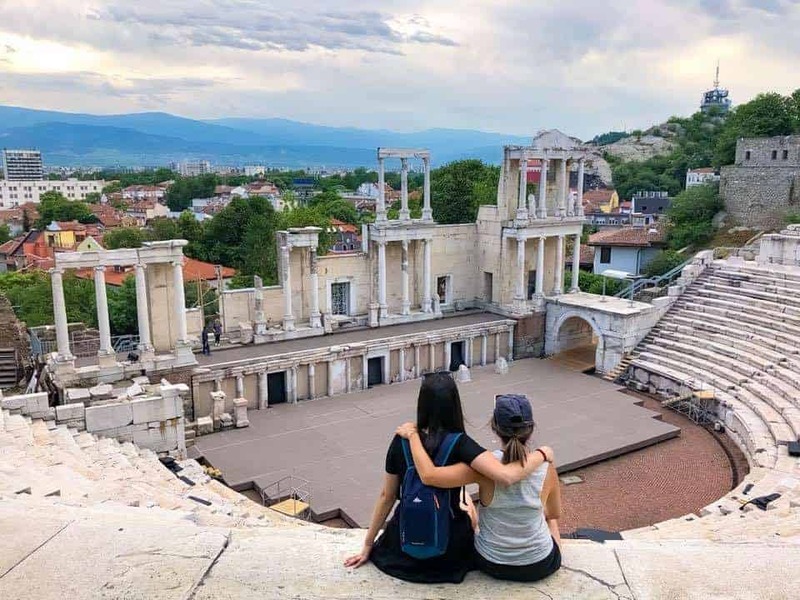 In case your trip does not coincide with a Plovdiv Roman theatre event, you should still purchase a ticket to go inside the theatre and have a walk around one of the top 10 tourist attractions in Bulgaria. 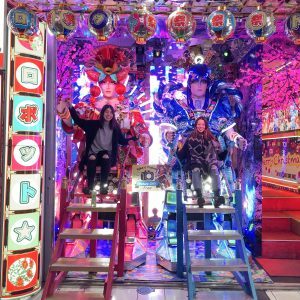 There are a set of stairs behind the stage that lead up to the stage, so you can get a view of the theatre as if you were a performer on stage. Be careful as you make your way down the steps, as many of the steps are still made from the original marble from the first century A.D. and can be very slippery, especially when wet. Make sure you get to the Ancient Theatre early as entrance to the theatre ends in the late afternoon, and access to the back stairs is not always available. Just across from the Dzhumaya Mosque is the Plovdiv Roman Stadium, which you won’t be able to see from ground level until you are very close to the stadium because the remains are all underground. Unless you’re traveling around Plovdiv with a tour guide or have done extensive research on your own beforehand, you may not know that the entire pedestrian street sits above ancient Roman ruins. At the bottom of the steps of the Plovdiv Roman Stadium, you will see a map of the entire stadium from the first century A.D., which shows you just how large the stadium was before parts of it were demolished. 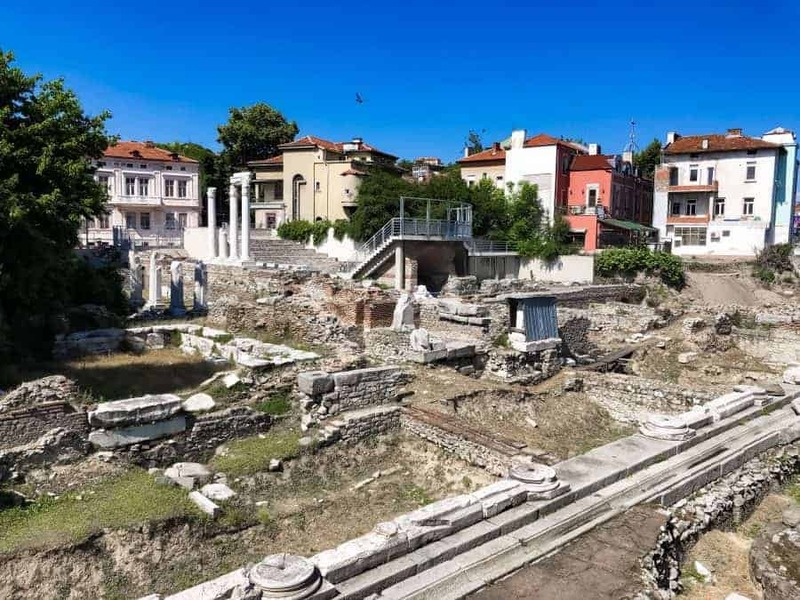 There is also a small museum you can explore to learn more about the Plovdiv Roman Stadium and a restaurant with a balcony overlooking the stadium if you’d like to spend some extra time exploring this hidden gem. Plovdiv Old Town is located on three of Plovdiv’s hills – Nebet Tepe, Dzhambaz Tepe, and Taksim Tepe (tepe means “hill” in Bulgarian). While hints of the Antiquity, Middle Ages, and Revival periods can be seen here, one of my favorite things about Plovdiv Old Town is the Revival style architecture that you’ll see all around. There are two things in particular that really stood out to me about many of the houses in Plovdiv Old Town: (1) that they are built mushroom style – meaning the base of the house is smaller, and the top floor of the house is larger, and (2) that the decorations on the outside of the houses are just as intricate as the decorations on the inside of the houses. The first phenomenon came to be because back when the Turks controlled Plovdiv, Plovdivians were taxed on the square footage of their homes, as calculated from the ground floor. By building their houses “mushroom-style,” they were able to pay tax on the smallest possible square footage, while still retaining as much space as they could inside their home. Pretty clever, huh? We thought so. You can’t visit Bulgaria without sampling some local rakia, a type of fruit brandy popular in Bulgaria and its neighboring countries. 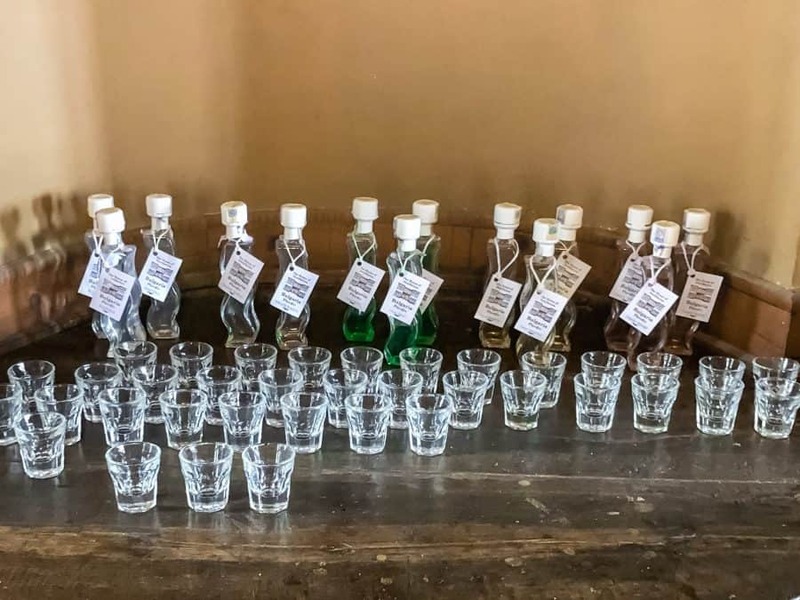 For the best rakia, make sure you go to the House of Distillation, a family run distillery and museum where you will be treated to some of the most unique and delicious liquers you’ve ever tasted. The hours are typically 10am-6pm, but as with most things in Bulgaria, time is relative and you should always be prepared to alter your plans if something is closed when you think it should be open. 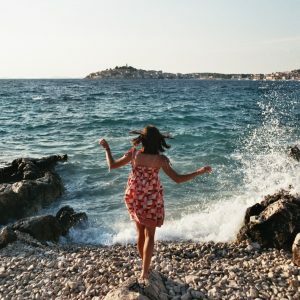 Just throw back a few rakias and try to adopt the locals’ philosophy of aylyak, an untranslatable Bulgarian word which very broadly means to be ultra relaxed and happy with enjoying the moment without having a care in the world. Although Plovdiv is known as the “City of the Seven Hills,” there are actually only six hills remaining today, with the seventh hill having been converted into a shopping mall. 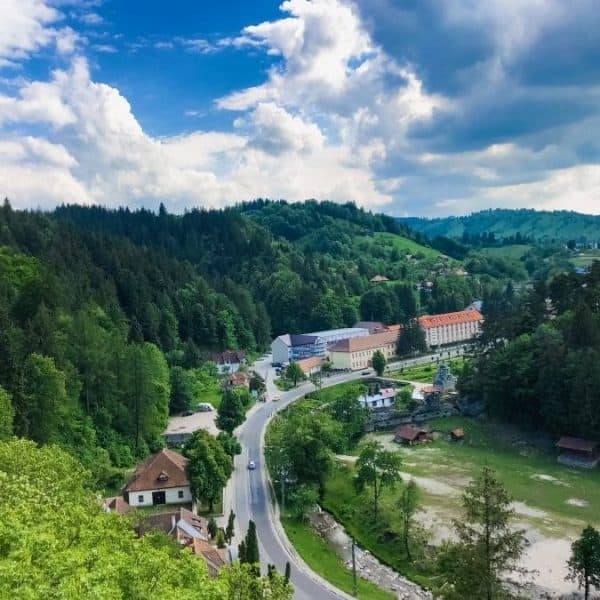 Nevertheless, these six remaining hills are still rich in history and will give you a good workout too if you’re looking to work off all the delicious Bulgarian food you’re about to eat here. The highest of the remaining six hills is Dzhendem Tepe (Youth Hill, with tepe meaning “hill”) at the southwest part of the city. However, the two hills I would most recommend checking out are Nebet Tepe and Bunarzhik Tepe (The Liberators Hill). Nebet Tepe contains remains of the old city fortress and a secret tunnel from Roman times that the Apostle Paul allegedly used to escape. On Bunarzhik, you will find the large Alyosha monument, a 36-foot tall statue of a Soviet soldier, left behind from communist times. Although Bulgarians no longer espouse this philosophy, nor do they look fondly upon the communist era, they are also well aware that destroying a statue will not destroy a country’s history, so Plovdivians have decided to keep the statue on Bunarzhik Hill as a reminder of their history and how far they’ve come. What is ethnography, you ask? Don’t worry, I wasn’t sure either. Ethnography, quite simply, refers to the study of people and cultures. As far back as 1891, there were talks of opening an ethnographic museum in Plovdiv, but it wasn’t until 1917 that those talks turned into action, thanks to Stoyu Shishkov, a local scholar and journalist. Today, the museum has a collection of over 40,000 exhibits in the areas of agriculture, crafts, fabrics and clothing, furniture and interior, musical instruments, religious items, and works of art. If you really want to get a feel for the local culture, not just in the present but also dating back hundreds of years, then the Plovdiv Regional Ethnographic Museum should be at the top of your list of things to do in Plovdiv. Wine is a big part of Bulgarian culture, and some even say that wine originated from Bulgaria. To this day, Bulgaria has the perfect landscape for growing grapes and making wine, and one of the top things to do in Plovdiv is to experience a local wine tasting. 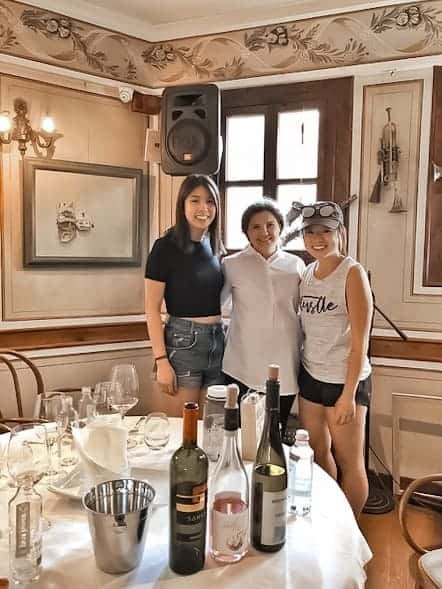 We had an amazing experience at Hebros House, where the incredibly hospitable Gerry offered to host us for a wine tasting despite being seven months pregnant at the time! Having trained formally in the UK and returned to Bulgaria, Gerry was extremely knowledgeable about wine, very professional, and patiently answered our (not so smart) questions about wine. She also prepared some traditional Bulgarian food for us to munch on as we sampled our wines. 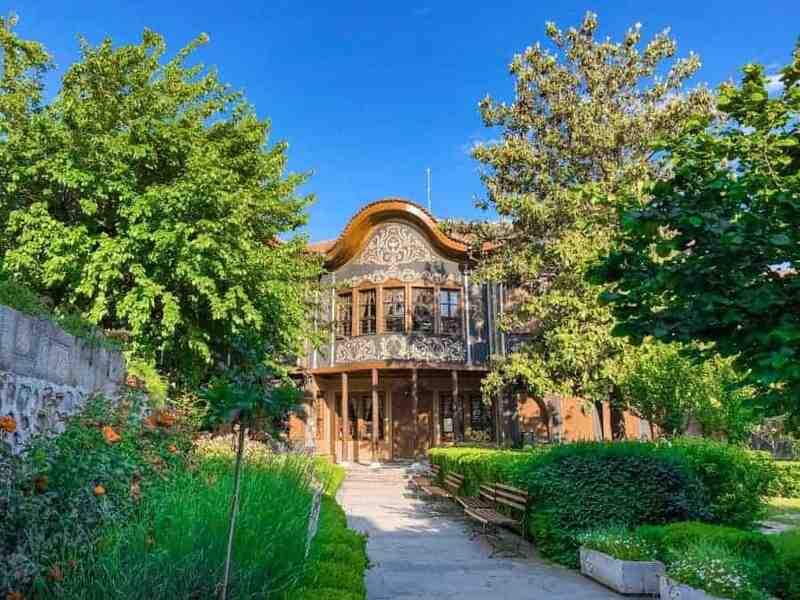 As if it weren’t enough that Hebros House serves traditional Bulgarian food and wine, it also offers accommodations for its guests, so if you’re looking for a place to stay in Plovdiv, I would definitely recommend checking out Hebros House. The first thing we noticed as we walked up to the Church of the Holy Mother of God (formally called the Cathedral Church of the Dormition of the Holy Mother of God) is that it was hidden on all sides by tall walls. All that could be seen was a tall belfry with the inscription, In memory of the liberators. 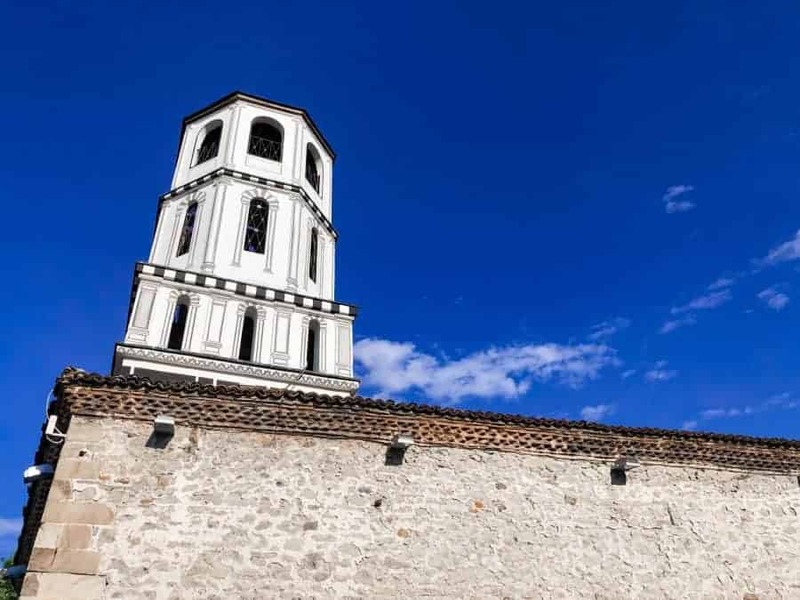 Although this church has existed since the 9th century, it wasn’t until 1881 that the belfry was built as a symbol of Bulgaria’s independence from Ottoman rule and a sign of gratitude to the Russian soldiers who helped liberate the country. 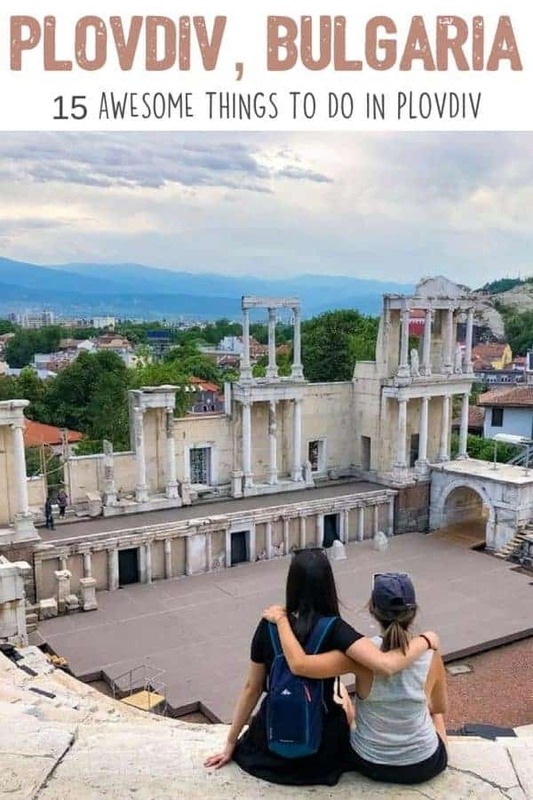 The Odeon of Philoppopolis was the site of the ancient Plovdiv city council, which was formed in 2nd century A.D., and its remains can still be seen in Plovdiv today. In addition to the seat of the ancient Plovdiv city council, the Odeon also contained an ancient theatre. It’s located just off the main pedestrian street and has been pretty well preserved since it was discovered in 1988. 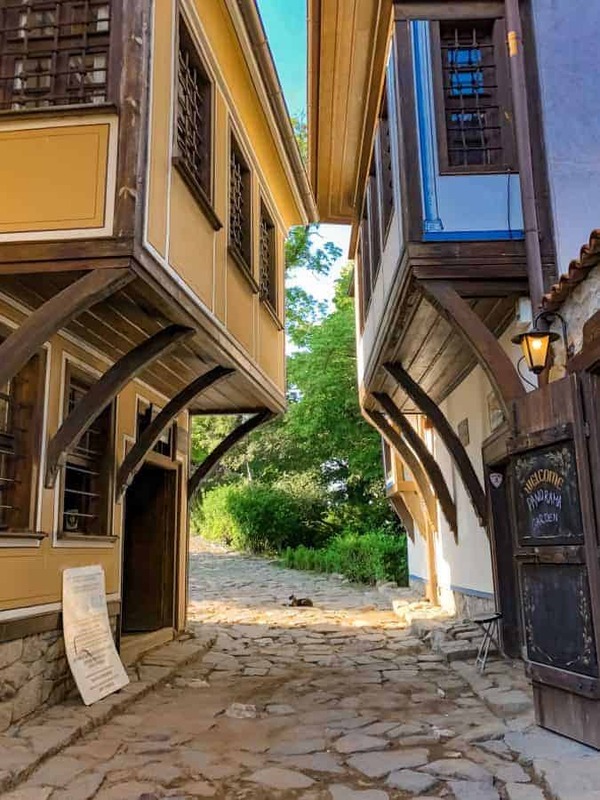 Kapana, also known as “The Trap” for how easily people get lost in its winding streets, is the hipster part of Plovdiv. 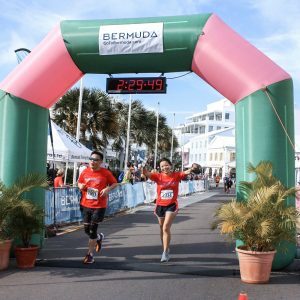 Here, you’ll find lots of art, local cafes, and lots of delicious craft beer. We enjoyed a few beers at a bar called “Cat and Mouse” in Kapana and would recommend going there if you’re looking for a chill night out with friends and some good drinks. 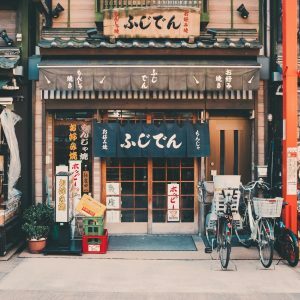 Although they do not serve food, you can find lots of good food nearby in Kapana and also on the street food street a couple of blocks away. We climbed to the top of Bunarzhik Tepe and watched the sunset next to the famous Alyosha monument one night with Slow Tours Bulgaria. You can get a good sunset view from just about any of the hills in Plovdiv, but I really enjoyed the view from atop Bunarzhik Tepe, and it wasn’t overly crowded, although there were a good number of locals and tourists alike waiting for the sunset here. For an extra special experience, pack yourself a little picnic or bring a couple of drinks to enjoy as you wait for the sun to set. We definitely got a good first impression of Plovdiv by meeting up with Irina and Paul from Slow Tours Bulgaria and having local tour guides take us around to all the best local spots in the city. We got to try local foods, local drinks, and really get a feel of what it’s like to live in Plovdiv. 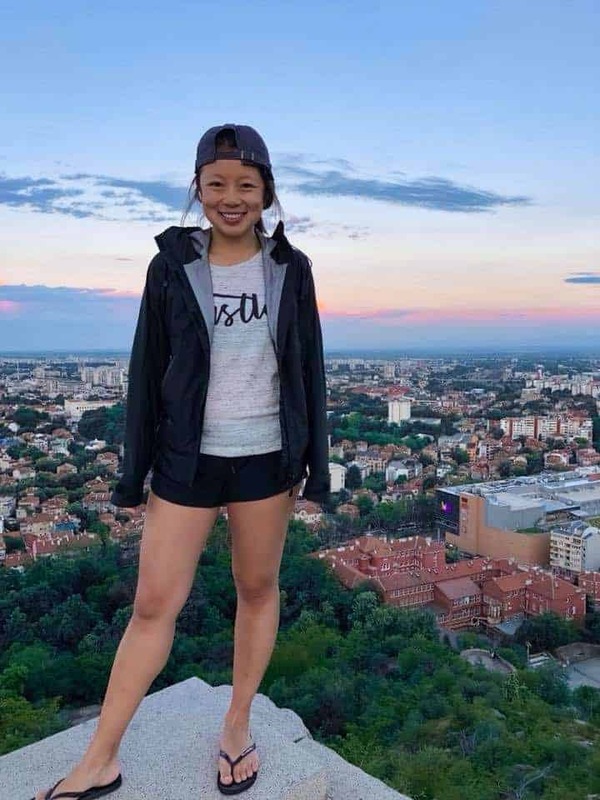 Irina and Paul are some of the best people we’ve met on our travels, and if you’re looking to explore Plovdiv with a couple of local friends, you’ll want to call Irina and Paul and schedule a time with them. 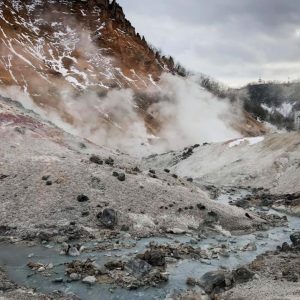 If you’re only in Bulgaria for a short time and don’t have time to dedicate part of your road trip specifically toward the Rhodope Mountains, you’ll at least want to take a day trip from Plovdiv to the Rhodope Mountains. Although you can technically see the Rhodope Mountains from Plovdiv, it’s a completely different experience being inside the mountains and going for some hikes in the Rhodopes. You can either hire a car and drive yourself to the Rhodope Mountains, or you can arrange a tour with some locals like Irina and Paul from Slow Tours Bulgaria. 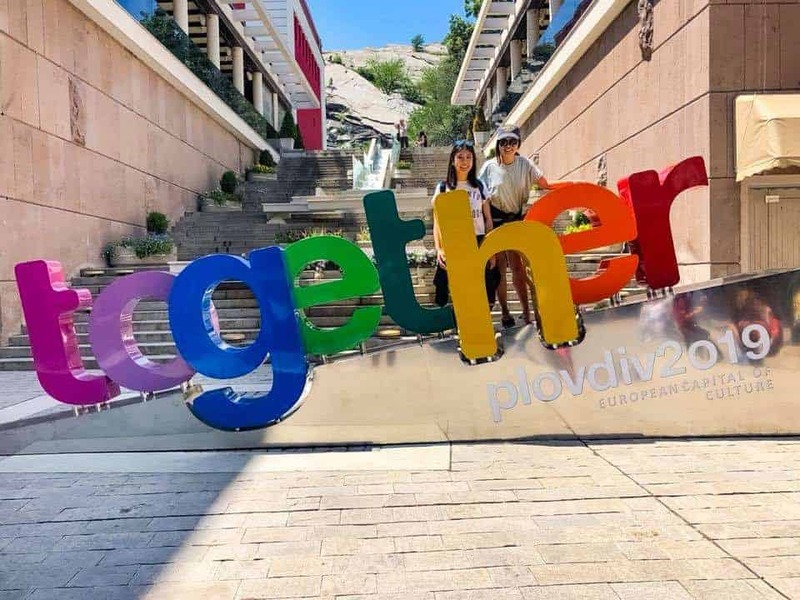 Whether you’re looking for a heavy dose of history and culture, a fun, hip weekend with friends, or just a chill, aylyak few days, Plovdiv has it all. 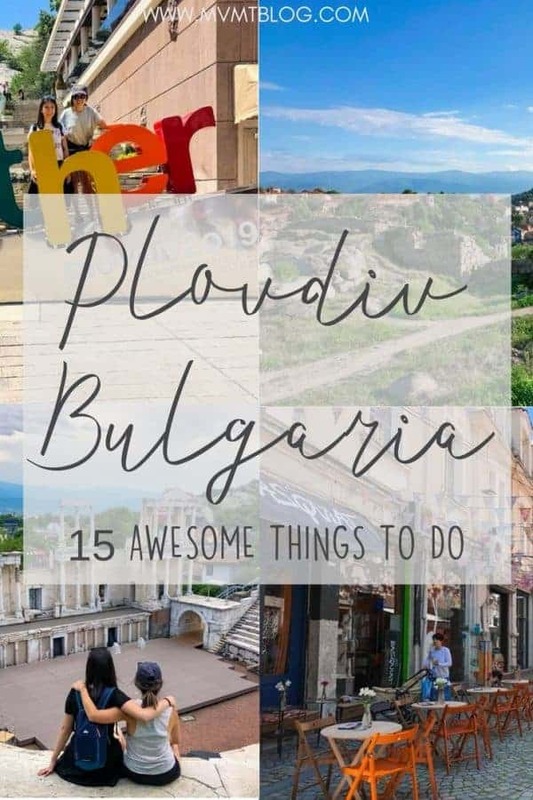 This list of 15 awesome things to do in Plovdiv is only the tip of the iceberg, as there is so much more to discover and experience in Plovdiv if you have the time. Plovdiv is not only one of the best cities to visit in Bulgaria, but one of the best in Europe and in the world. Even I had not heard of Plovdiv till I read this. There is so much to do here. I am particularly interested in the Roman history of the place. It would be amazing to attend a concert in ancient Roman theater. The old town also looks so charming. Rakia and local craft beer also sound great! 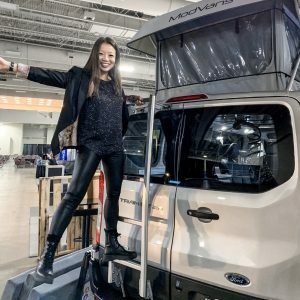 This was very interesting! I have been to Bulgaria but I don’t think I have ever heard of this town. Looks very lovely though. Especially the ancient theatre would be something I would definitely go see here. Looks like you had a great time exploring Plovdiv. This is such a beautiful place and you have captured it so well in this post. I loved reading about the mosque which was once a church. And the old town looks like my kind of place – where I can discover a lot more when you just walk around. The hike across the hills too, seems so interesting. Beautiful pics. 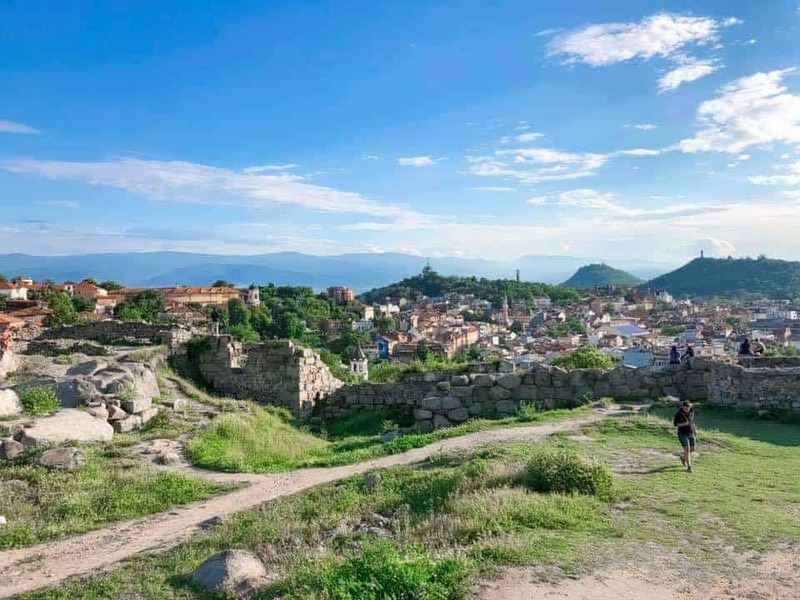 Plovdiv look natural wonders with those rolling hills, green countrysides and amazing ancient architecture. 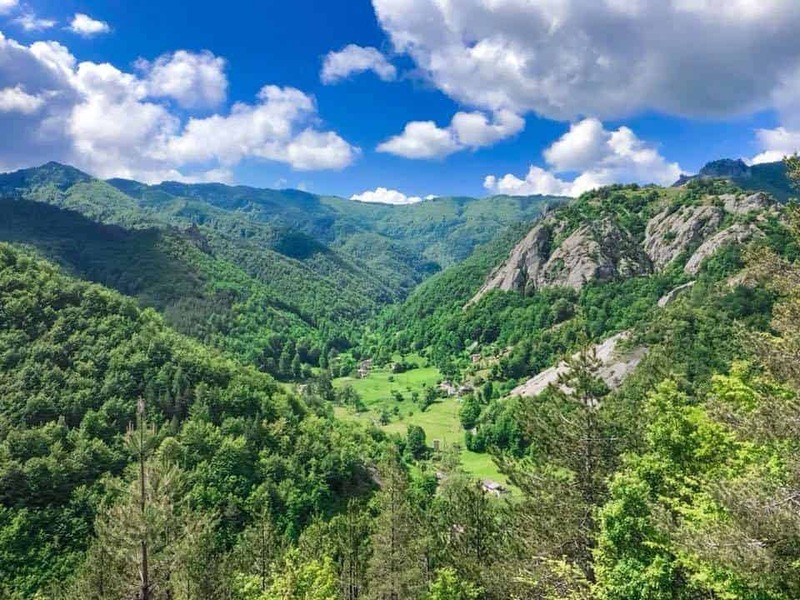 Day trip to Rhodope Mountains is worth as it looks very scenic. Plovdic Old Town looks quirky and interesting. This city looks so lovely! The Ancient Theatre is definitely great for a concert. Also, I would love to Hike Across the Seven Hills of Plovdiv as well. Discovering Remains of the Old City Council and then trying some craft beers sound like a great day for me. I love the fact that Bulgaria is still unexplored by hordes of tourists and has its charm intact. The ancient theatre looks so good, straight out of history books. 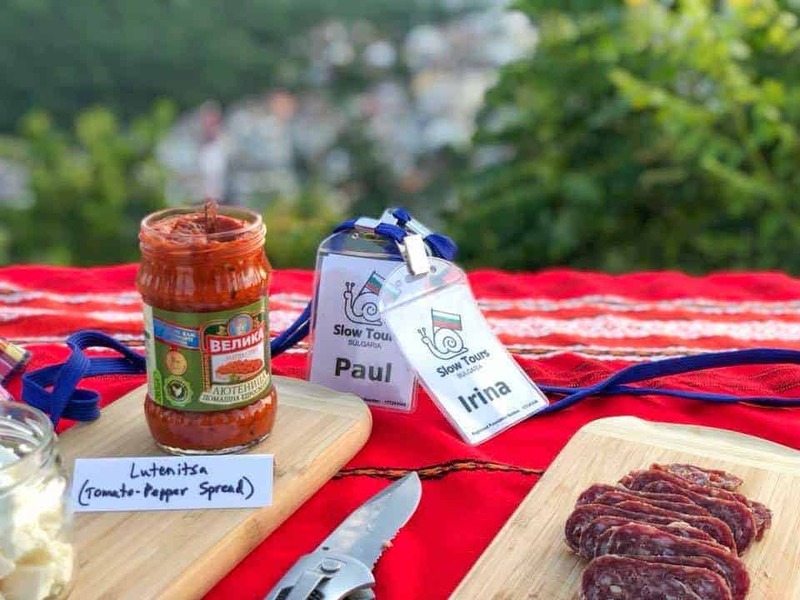 Slow tour Bulgaria with locals sounds amazing and view from the Bunarzhik Tepe is stunning. 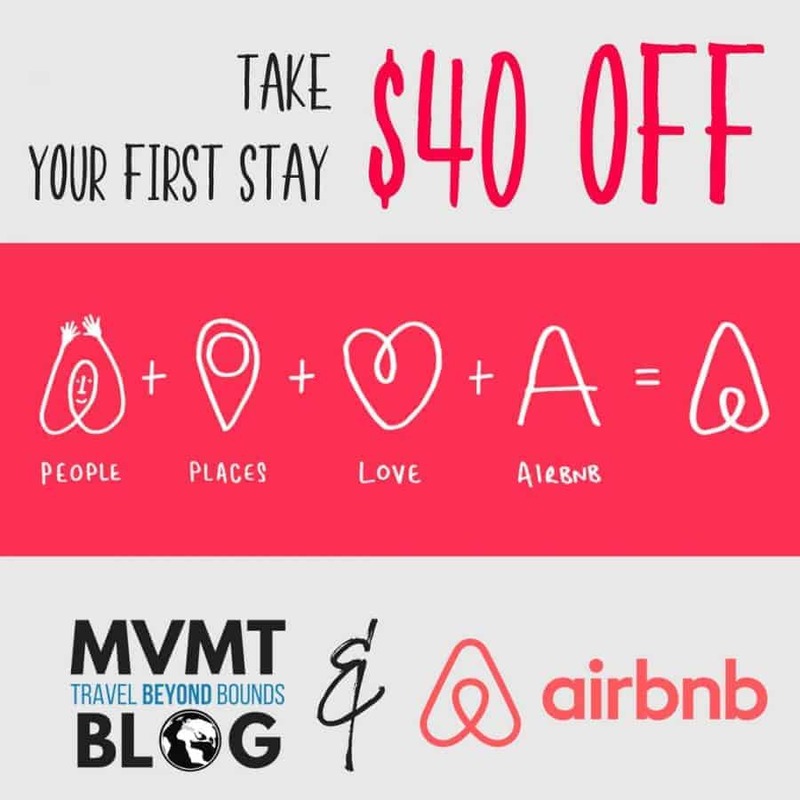 This is quite an offbeat list to explore. Walking on the longest pedestrian road looks interesting. While I would certainly like to try the local drink &ethnographc museum. Hiking would also make it to my list from these. I had never heard of Plovdiv. This looks like a undiscovered gem. That Ancient Open Theatre and the Church look so beautiful. I love walking so I just can’t miss the longest pedestrian street of Europe in Plovdiv. Thanks for sharing. I like learning about new places. Plovdiv indeed seems beautiful. Glad to know there’s so much to see and do in Plovdiv. The Ancient theater is rustic and huge. I can imagine how it might look during a concert. I loved the wall arts in Kapana – seems to me as a very happening place to eat, drink and laze out. A very interesting guide on Plovdiv. Thanks for sharing. Plovdiv was not really on my radar before this post, but it definitely is now! Looks like such a beautiful and interesting city. I love how a lot of your to-do’s involve sampling local beverages – why is the distillery secret?? It’s one of my favorite cities in Europe, and I’ve been to well over 2/3 of Europe! The distillery seems like a secret still because there aren’t any clear signs outside, so it’s very inconspicuous. It was actually closed when we went, but since our guides knew the owners of the distillery, the owners kindly let us in and gave us a tour in the middle of their lunch! To be honest, I have no idea about Plovdiv. 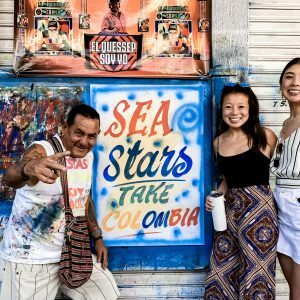 After reading your post, I must confess it is such a beautiful destination with so much to do. There is history, art, food/drink and some beautiful natural surroundings. I perfect place to unwind and spend some good time. Good to know a lot of things about Plovdiv for first-time. It’s always nice to explore any new place like a local. I can see Plovdiv has everything to offer for any travelers. Informative! 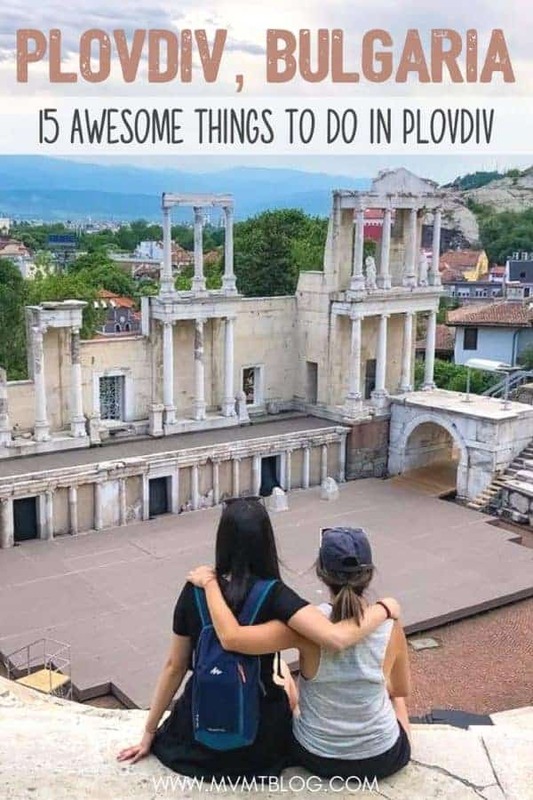 Wow Plodiv seems like a wonderful city, and this is the first time I’m hearing about it which I’m glad about btw 😉 I love how you find the roman ruins and the mosque looks stunning. Thanks for sharing! Ashamed to admit that I didn’t know anything about Plovdiv beyond its name, before I read this post. Now, I can’t believe that I’ve missed visiting such an interesting place! Must figure a way to go asap!! I’ve heard wonderful things about the wines in Bulgaria and it’s one of the main reasons I want to visit the country. Plovdiv is new to me and it looks like a charming and beautiful city. Will now add this second city of Bulgaria to our plans when we go. Thanks for the informative article! Honestly, I’ve never heard of Plovdic until now but it looks beautiful and peaceful. The old town is especially gorgeous. Also, 30 countries in Europe is an incredible feat. I love the photos! Wow, so stunning. And 2 kilometres? I’d have been panting. You all look beautiful and thank you for sharing Plovdic with us. 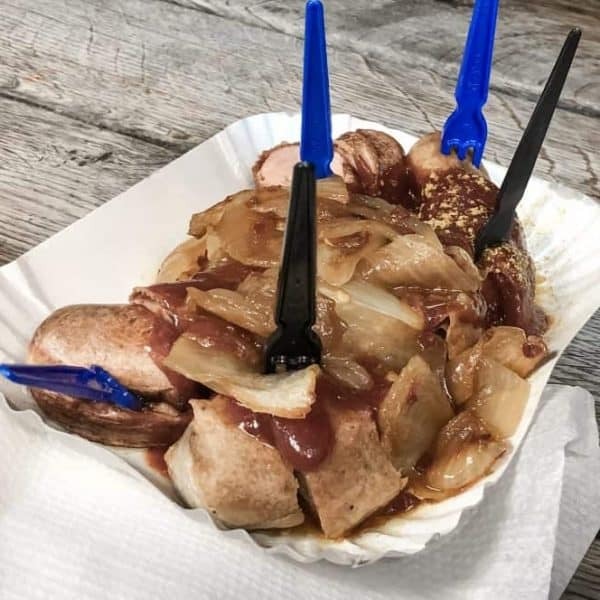 Never heard of the place but you did it justice. I had never heard of Plovdiv before I read your post! 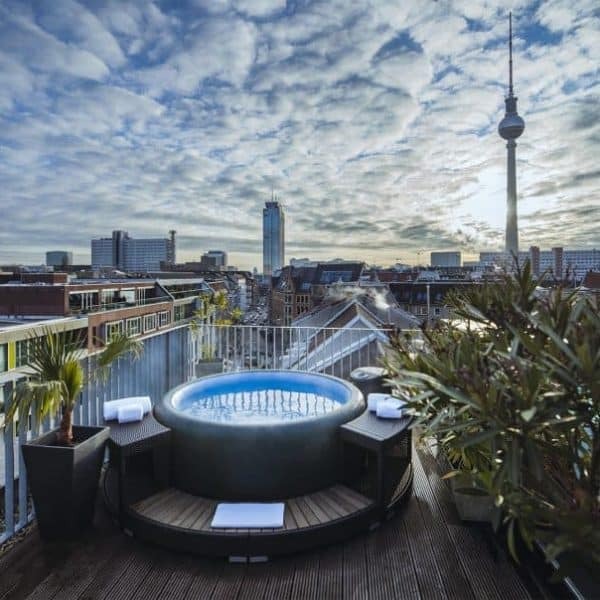 It’s always lovely to discover some new underrated city worth the visit. I love the architecture of the Ethnographic Museum it’s so unique. I’ve never even heard of Plovdiv, but it’s on my list now! The Ancient Theatre looks beauuuutiful!